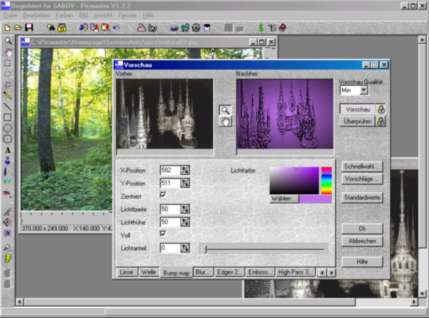 Main features: Image Editing, Filtering, DigiCam, WebCam, Slide Shows, Morphing, 3D Images, Video Images, Capturing, Scanning, Catalogs, Poster Printing... Thousands of Photoshop? compatible filter plugins from the Internet are includable. Over 300 Filters already included. Morph people into other people. Enlarge noses/ears. Record a sound comment to each picture and play it on the slide show. The dialogs are user-friendly and with preview. ...... experience. Save your slide show on a self running cd, as a screen saver or as a website. Morph people into other people or animals. Enlarge people's noses and ears. Create real 3D-Images that can be seen with mirrors and red-blue glasses. Watch 3D-objects emerge out of your monitor. Print out your own glasses with PicMaster. An image browser in Explorer-style shows you all images as a thumbnail preview. You can choose the displaying order with different sorting possibilities. The webcam images can be uploaded into the Internet via FTP, HTTP or Email. The system can also detect movements and turn into an alarm system. All commands can also be entered, saved and executed at a command prompt so that repeated operations can be automated. For example print out all pictures of a folder with only one command. With the possibility of previewing all operations, PicMaster becomes a very comfortable program for you. Qweas is providing links to PicMaster 4.0.3 as a courtesy, and makes no representations regarding PicMaster or any other applications or any information related thereto. Any questions, complaints or claims regarding this application PicMaster 4.0.3 must be directed to the appropriate software vendor. You may click the publisher link of PicMaster on the top of this page to get more details about the vendor.